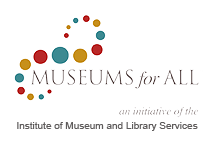 This exhibition was organized by the Asheville Art Museum and is guest curated by J. Richard Gruber, PhD, Director Emeritus Ogden Museum of Southern Art. Ralph Burns has long been recognized as a documentary photographer whose images have captured the diverse and enigmatic nature of ritual and religion, and who has explored the subjective and often defining nature of belief, worship, and culture. 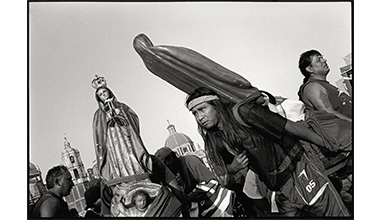 Like his predecessors — such as Walker Evans, Diane Arbus, Mary Ellen Mark and Robert Frank — Burns uses his cameras to probe a constantly shifting human landscape and to document the public and private aspects of culture and religion in transition, often working at the unclear and overlapping intersection of both. Throughout his career, Burns has displayed a continuous and persistent interest in the motivations for worship and ritual while maintaining a compassionate and non-judgmental intimacy with his subjects. He has photographed both collective and individualized manifestations of what he sees as a seemingly irrepressible human need to ritualize loss, love, and death, and to formally externalize and codify hope and the desire for transcendence. The photographs in A Persistence of Vision illuminate Burns’s concerns and interactions: an Elvis fan seemingly keeping vigil over a blanket-covered, bed-ridden Elvis icon in Memphis; a penitent in Mexico carrying the statue of Our Lady of Guadalupe, strapped awkwardly to his back; a man staring hard into the distance while being prayed over for healing at a Marion apparition site in Georgia; a woman in agonized ecstasy struggling with being baptized in the Jordan River in Israel. A native of Louisiana and a resident of Asheville since 1975, Burns has travelled great distances to photograph a specific event or religious festival. He has photographed in New Orleans, Asheville and Western North Carolina, the American South, Mexico, Cuba, Israel, England, Thailand, Nepal, Afghanistan, and Europe. Burns is recognized both nationally and internationally, exhibiting his photographs in museums worldwide. In her curator’s statement for Heaven, a group exhibition that included a number of Burns’s photographs and exhibited at Kunsthalle Düsseldorf in Germany and Tate Liverpool in England, the German/Israeli curator Doreet Levitte Hartten wrote: “(His) insights into the religious character … makes Burns’s work, apart from their aesthetic qualities, into documents of anthropological significance. Front Image Credit: Ralph Burns. Che #2, Havana, Cuba, 2002. Silver gelatin print. 11 x 14 inches. Courtesy the Artist.